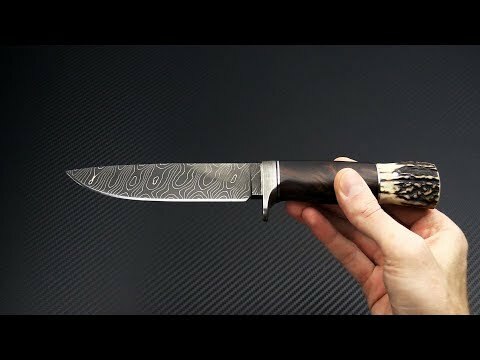 The Burr Oak Custom Camp Knife is a serious full custom fixed blade knife handmade by Mark Nevling. The Camp Knife is a visual masterpiece but it sacrifices nothing in terms of functionality delivering exceptional field knife performance. This piece is made from a Bold Twist pattern carbon steel Damascus blade with a Stag pommel and Desert Ironwood handles with nickel silver spacers and wrought iron guard. Blade: The Camp Knife comes with a long, beefy drop point blade that is convex ground for toughness and cutting performance. The blade has belly enough for skinning tasks with plenty of straight edge for outdoor utility. The carbon Damascus is tough and takes a razor sharp edge for easy maintenance in the field. Handle: The handle is essentially two parts: a large and rugged Stag pommel and a smooth desert Ironwood handle framed by nickel silver spacers. The neutral handle design in comfortable in nearly any grip and well balanced for extended use. A large, wrought iron finger guard keeps your fingers safe from the blade during use. Sheath: Carries via hand stitched leather belt sheath with Bison leather overlay.